Just about everyone agrees that the world would be a better place without the brutal terrorist group known as ISIS (or Islamic State or ISIL). On Wednesday, Barack Obama compared the group to a "cancer" whose spread must be contained and that the group "has no place in the 21st century." And Secretary of State John Kerry tweeted that "ISIL must be destroyed/will be crushed." But there is one thing everyone must realize in the anti-ISIS crusade: Given the momentum that ISIS has built over the past two years in Syria and Iraq, it would be very difficult to dislodge them from the region. To actually do it would require a full-scale war. "If destroying ISIL becomes the near-term policy goal—which seems the likely outcome of saying you are going to 'roll back' the group—then 10,000-15,000 troops vastly understates the true commitment, which will actually require years, direct military action on both sides of the Iraq/Syria border, tens (if not hundreds) of billions of dollars, and many more than 15,000 troops," counterterrorism expert Brian Fishman writes in War on the Rocks. "ISIL is an inherently resilient organization—look how far they have come since getting 'rolled back' during the Surge in 2007 when 150,000 American troops were occupying the country." ISIS has gone through many iterations since the U.S.-led invasion of Iraq and is now at its most powerful point as they control a vast swath of territory across Syria and Iraq. What has become a de facto criminal petrostate brings in nearly $12 million a month in revenues from extortion and other shady practices in the Iraqi city of Mosul alone in addition to $1 million to $3 million a day selling oil illegally. "No one has offered a plausible strategy to defeat [ISIS] that does not include a major U.S. commitment on the ground and the renewal of functional governance on both sides of the Iraqi-Syrian border," Fishman adds. "And no one will, because none exists." That said, there are moves the U.S. can make beyond bombing ISIS positions near the Iraqi Kurdish capital of Erbil (or Arbil) and the Mosul dam. 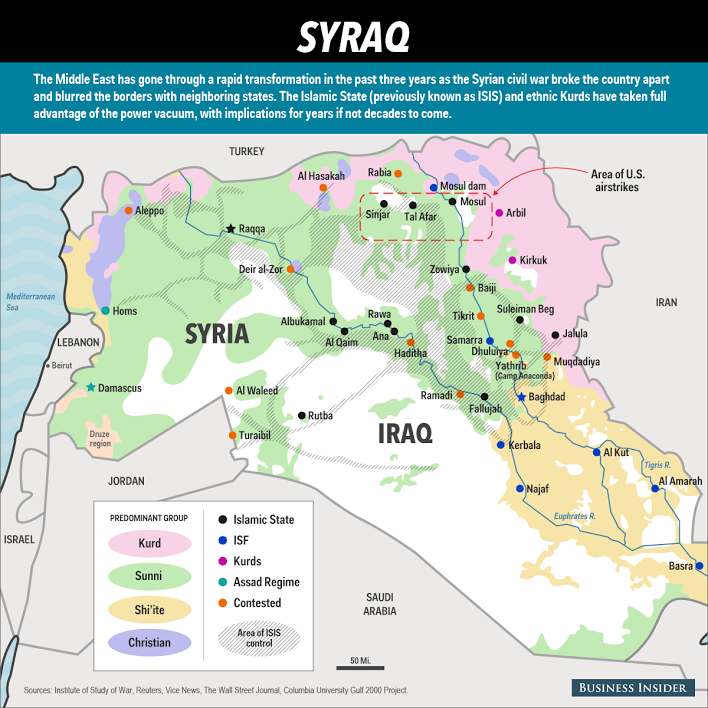 "The breadth of the Islamic State's presence in the open expanses of Syria and Iraq is testimony to its prowess," former Iraq and Kurd advisor Michael Pregent and journalist Michael Weiss wrote in The Wall Street Journal. "But it is also testimony to its vulnerability to destruction by U.S. F-18s." To that point, some ISIS commanders have retreated back into Syria amid t=the ongoing U.S. airstrikes. "U.S. has total air superiority and ISIS isn't used to fighting this kind of enemy," Aaron Stein, a fellow at the London-based think tank The Royal United Services Institute, told WSJ. "So they've turned tail" to an area where they have much more strategic depth. Garrett Khoury, Director of Research and Content for The Eastern Project, writes that the situation calls for an inclusive government in Iraq, weapons and training for the Iraqi Security Forces and the Kurds, and an international conference on confronting ISIS. And it's increasingly clear that something more must be done. James J. Jeffrey, the American ambassador to Iraq from 2010 to 2012 and a visiting fellow at the Washington Institute, writes in Foreign Policy that the sooner the U.S. begins a sustained campaign against ISIS, "the less complicated our involvement will be, the greater our chances of success, and the more likely IS's forces can be defeated before they tear apart the region completely — and directly threaten America." But any sustained military campaign involving U.S. troops would also require an about-face from an increasingly isolationist America. "The country must be ready to accept the sacrifices necessary to achieve grand political ends," Fishman concludes. "Until then, any call to 'defeat ISIL' that is not forthright about what that will require is actually an argument for expensive failure."